Finishes including mirror finishes can be generated with polishing rollers FAPI-GLAM on steel, stainless steel, NE metals, glass, plastic, marble and stone. The polishing rollers FAPI-GLAM are used together with polishing compound to achieve a high gloss mirror finish. Polishing rollers FAPI-GLAM are flexible and adapt ideally to the workpiece. 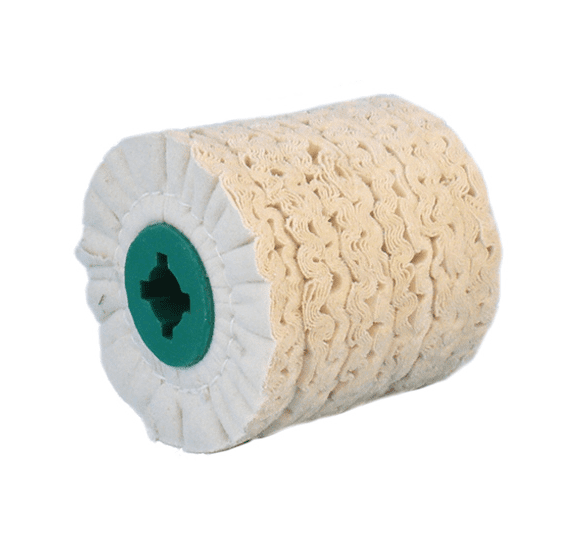 Polishing rollers FAPI-GLAM provide polishing results of higher quality than are achieved with conventional cotton wheels. The design of the polishing rollers FAPI-GLAM prevents heat build-up in the tool and therefore burning of the selected cloth. Always use the polishing rollers FAPI-GLAM at a lower speed than a tool with abrasive cloth. In addition to a better surface finish on the workpiece, you increase the service life of the polsihing roller FAPI-GLAM.